A study published on Thursday by the Enough Project examined 20 of the world's largest companies in terms of market capitalization. Mineral supply chains examined include tin, tungsten, tantalum, and gold. Apple emerged as the "clear leader" scoring 114 out of a possible 120 points. Following the top five, including HP, Microsoft, Intel, and Google, the remaining electronic companies take a precipitous drop in rankings, with Panasonic scoring 42.5 —and the anchor of the charts being Toshiba at 9. Tin is a common semiconductor and structural mineral. Tantalum is used in capacitors and resistors, and used in other alloys to grant strength and corrosion resistance. Gold is an excellent conductor, and is effectively corrosion-free. Tungsten has a wide array of uses in fabrication materials, can be used for wear-resistant coatings and in emitters. Also examined with the same scale were jewelry companies like Signet and Tiffany, with Signet holding a lead at 66.5 points. Tiffany scored 60 points. The remaining jewelry companies scored between 0 and 20 on the scale. The Enough Project defines "conflict-free minerals" as minerals that do not directly or indirectly finance or benefit armed groups, including state military units from Congo as well as other predatory regional governments. 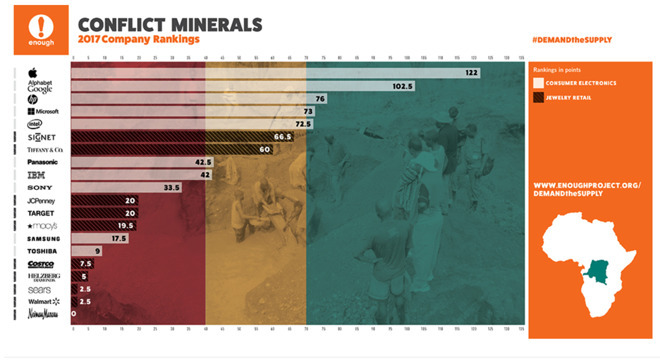 Because these rankings are focused on activities related to Congo, companies were awarded credit for criteria pertaining to sourcing conflict-free minerals if they were able to demonstrate that the minerals in their products were not financing armed violence in Congo or the African Great Lakes region. The group recommends that consumers contact companies that use the materials to either laud their efforts —or exclaim dismay at the poor showing.